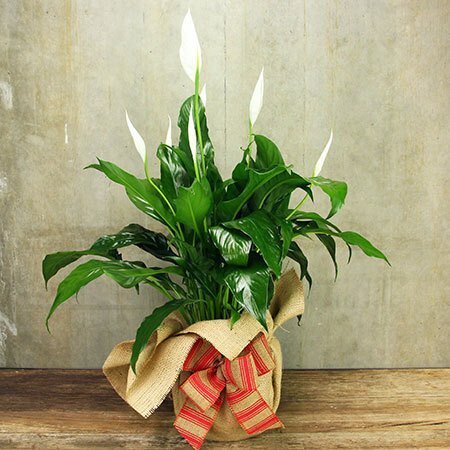 Deliver Xmas in a pot with our tropical anthurium lily plant. Beautifully presented in a hessian wrap and festive bow, this plant makes the perfect Xmas gift idea for men or women.� Long lasting and easy to care for, this indoor lily plant� is fabulous just as it� is, or� paired with a bottle of bubbles or chocolate from our range of additional gift add ons.� Order via our online florist shop, email sales@flowersforeveryone.com.au or give the team a tinkle on 1800 66 66 46. The pictured presentation and gift wrapping is exclusive to Sydney metro region deliveries only. For flower delivery outside the Sydney metro region, our team will coordinate your order via an affiliate florist network to recreate our presentation as closely as possible.